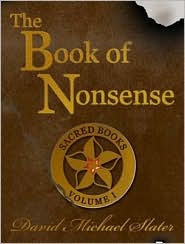 David Michael Slater's The Book of Nonsense is the first book in his Sacred Books Series, a projected series of five books designed for Middle School readers. I hope the next books in the series are a little more exciting, because, for me, this one dragged. When Daphna and Dexter Wax' father, Milton, returns home for his job as a book scout, just before their thirteenth birthday, Daphna is excited to show him the new bookshop in the village, The Antiquarian Book Center. Daphna loves it, considering it the ABC, holding everything about magic. She's just a little leery of Emmet, the monstrous boy who works there. Dex wants nothing to do with the store, or Emmet, who has beaten him up. But, there's worse things in the bookstore than Emmet. When Milton tries to sell a special book there, Asterious Rash, a mysterious old man, somehow gains control over Milton and the book. When Daphna explains the problem to Dex, they unite to find out the secret behind the book. Soon, it looks as if Rash might also control Daphna in his search for power. Most readers in the eleven to thirteen year range will find this book too obsessed with an old book, with little action. The adults in the book are not well-developed, and the twins don't know each other well. The books seem to be designed for readers passionate about literature, and there won't be too many readers who appreciate this kind of literature at that age. As a librarian, I did appreciate one section, describing Daphna's passion. "But of course it wasn't smells that made Daphna love books. No, it was the words themselves. It was mind-blowing to think that you could learn absolutely anything in the world if you just had the right words in the right order." I just don't think middle school readers will be passionate about The Book of Nonsense. But, it's just my opinion. The book is a finalist for the Assoc. of Booksellers for Children's Best Books 2008 & Cybil Award nominee. The Book of Nonsense by David Michael Slater. Blooming Tree Press, ©2008. ISBN 9781933767000 (hardcover), 256p. Ah! I can't believe you didn't love this book. First negative review I've come across (21 4/5 star reviews on Amazon)! I found it to be an absolute page turner in which the action begins from the start and doesn't falter right through the last page. I work with some teens who've read the book, and they loved it too. They thought the plot twists at the end were totally unexpected, and they loved the nasty relationship between the two kids. I do hope it wins some awards. I loved the book as well and I'm a middle school teacher! We've been recommending it to kids in our building and it's getting good reviews. I protest as well! This book was outstanding, something finally a little different. A bit challenging, true, but totally original and rewarding. The teen I know who read it can't wait for the next one, and neither can I.
I am surprised by Lea's review. I loved this book, as did my 12 and 14 year olds. Perhaps she underestimates middle schoolers? We were totally caught up in the mystery and SHOCKED at the ending. Can't wait for the next installment! I also disagree with this review. I thought it was a surprising story with fantastic twists and turns throughout. I love the way various characters intertwine in the story. What is wrong with obsession over a book? This occurred in Spiderwick Chronicles! My 11 year old daughter and I were equally captivated by Book of Nonsense. She's actually writing a book report about it now so other kids hear about it! I think "NONSENSE" is the very best fantasy novel I've read in all of 2008. I'm an Amazon Reviewer and I was intrigued from page one. It's different from so many other books out there, and David Michael Slater is rapidly becoming one of my favorite authors, if not THE favorite. Everyone is entitled to his own opinion, but in writing such a negative review, you may be steering readers in the wrong direction. I suggest for readers to read it for themselves and form their own opinions. I first "met" this author when I read three of his children's picture books: Cheese Louise, The Ring Bear and Flour Girl. All absolutely phenomenal and the concepts are brilliant in their originality. Kids love them. I would give "Nonsense" ten stars if there were that many. It's THAT good! Believe me! I TOLD you all it was just my opinion. (smile) I'm really glad to see that other people appreciated it more than I did. For me, it just didn't live up to books such as Rick Riordan's Percy Jackson books or some of the others I've read. As I said, it's my personal opinion. Whoa! This blowback is amazing. Inspiring that a book from a tiny press can muster so much support so quickly. Funny you mention Percy Jackson. I enjoy those books (wonderful concept), but the characters are pure cardboard, no? The silly, predictable coincidences require a generous suspension of disbelief, no? What I love about NONSENSE was how seriously it takes it's readers. That's just not something I've seen much in teen fantasy. There's an edge to the series that is just very intriguing. I've been following talk about it on the web - it seems the serious will get more and more serious as it goes, evidently into Da Vinci Code territory. Readers are pointing to the brief line in which it's suggested that the "First Tongue" might be the language with which God created the world. So maybe it's a matter of expectations. It's not all just "fun" a la Percy J. I think this will turn out to be a unique series and expect it to go big sooner than later. I heard the author talk here in Portland. He's a middle school teacher (which in my book makes him a saint). He was discussing the incredible odds against a book from a small press like this one (Blooming Tree Press) getting attention. He was so genuine and honest and funny that he recruited the crowd to help by telling bookstores and libraries to stock the book, and by posting reviews. Anyway, I see you are connected to Library Journal, which is critical to the success of books with few other review options. I do HOPE you will let someone else there take a crack at the book if they take it up. And they definitely should. I'm afraid I have no clout at Library Journal. I'm only sent the occasional novel to review there, and it's always women's fiction. 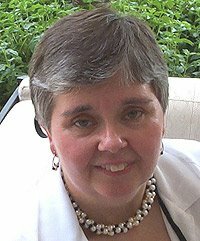 I review women's fiction for LJ, mysteries for Mystery News, and the other books for my blog and a few other sites. However, this review was picked up for syndication by Reuters. Remember, though, publicity is publicity, and the people who see the review through Reuters may be just as likely to pick it up if they find the subject intriguing as to reject the book because of my review. I did pass the ARC on to another librarian to read, and I asked her to tell me what she thought. I respect her opinion as a YA librarian. I understand there's a great deal of symbolism in the book. However, within the last couple months I had read a juv novel that dealt with a teen turning thirteen (I get the thirteen), and I thought it handled it better. And, I just read two books in a row with twins. I'm very good at suspending disbelief while reading fantasy, however I had a hard time believing Daphna would not know that her twin couldn't read. All of the twins I know are closer than that. Thanks for all the feedback. I'm always pleased when a book does well, and I hope this one succeeds as much as you all expect. There are plenty of books out there that have been bestsellers, and I didn't appreciate them. This series just may become a big hit. While I personally loved this book, I believe its totally okay for you to not have liked it. I loved it but that is my personal opinion. I am somewhat surprised by what seems to be this need to "correct" your impression of the book. Let's all please note that what may be profound and amazing to one person, may hold zero sway with another person. If you feel a book is great, let it stand on its on merit and be its own voice. Clearly, everyone is entitled to their opinion. Perhaps the strong response is due to readers feeling protective of wonderful small press work when so much of what we see is mass produced mediocrity. Bland reviews picked up by the likes of Reuters prevent good books from standing on their own merit because disproportional marketing budgets already make the competition unfair. So let's critique the critique. This is neither here nor there, but at the talk I heard given by the author, he talked about the advantage of having written all five books ahead of time, that they are all intimately tied together with hints and clues. He mentioned that some readers have felt that the adult characters weren't well developed and promised each and every one will be as the series goes on. He stressed that there are no irrelevant details. Someone actually asked about the 13th birthday thing. He said book one doesn't even scratch the surface of the its significance in the series. Wow!!!!!! That book was amazing!!! It was definitely one of the greatest books ever. I would recommend this book to middle schoolers, high schoolers, and adults. Great book! Josh & I made Patti's Blog! Sunday Salon - Books for Holiday Gifts!